‘Are you going to keep yourself safe this evening?’ asks the therapist. It’s nearly the end of the session. And it’s been a tough one. We’ve done some good work – knowing what I’ve previously been unable to know, feeling what I’ve previously been unable to feel – but I’m quivering right at the edge of my window of tolerance. And after previous such sessions I haven’t coped well. I don’t know how to answer. I don’t really know what she means. I don’t know what the right answer is. And I don’t want to get into trouble. ‘Yes,’ I say, looking away and down and wriggling slightly in my seat. She bites her lip and her eyelids squeeze together a bit. A long pause. She’s seeking me out and I’m watching her without looking at her. She pushes her lips into a faint smile and with enough lightness that I don’t feel in trouble. But I can’t not notice her seriousness. ‘Well, you need a plan,’ she replies. I have no idea how to formulate a plan for staying safe. I don’t understand the concept. I feel like she’s asking me to play chess blindfold. But I can also sense, from the way that she’s looking at me, that she’s not going to accept my excuses. I sigh, angry at myself. This feels a bit easier. Breaking things down into steps for me is always effective. It is a skill that I have for other people, but never – so it would seem – for myself, or at least not here. Because I have never stopped to consider any of these issues before. Life has always just happened to me. It is a new idea that I can formulate plans to manage what life throws at me – what I throw at myself. The list sounds a little stark now I’ve verbalised it. For the first time, I glimpse it from the therapist’s perspective. Yes, I can see why she wants me to develop a plan to stay safe. But as soon as I have that thought, I have another one to contradict it. But I don’t care if those things happen. I don’t care if I’m not safe. I shoot my eyes up towards her for half a second and then look away, feeling that too-familiar feeling of shame wash through me like the flush of a toilet. I fold myself forwards and down, trying to go small and find some comfort in disappearing. I feel annoyed with myself, partly for saying it, admitting it, and partly because I hate this constant push-pull of conflict within myself. And, of course, because I hate having parts. I want things to be different. I want to care about my own safety. I feel like I ought to. But I don’t know how. ‘Why do you think that part of you doesn’t care if you’re not safe?’ she asks at last. I shrug. I’ve never thought about it. I reflexively distract myself from thinking about my parts. But the therapist wants an answer, so I start speaking and hope that the words will come. The therapist’s face scrunches up into a look of acute sadness. ‘Ohhh!’ she says, as if she’s just trapped her finger in the door. I look up at her, surprised. That wasn’t the sound I was expecting. What does it mean? That I am worth keeping safe? We sit for a few moments with the sound still echoing in my chest, and I’m shocked by the reflexive honesty of it. To me, it’s just a statement: I’m not worth keeping safe. Of course not. Never have been. That was my experience in childhood. What else are you supposed to believe when you grow up living with your abusers? ‘I think you know that I think you’re worth keeping safe,’ she says eventually, breaking up the confused sludge of thoughts in my head. Not until just now, I think, but I don’t say it. I just nod and stare at her shoes. I focus my attention inwards, effortfully, doggedly. I’m not used to seeking out what my parts think and feel. It’s like looking for a black object in a dark room. I shrug again. I don’t know why that word came out of my mouth, but it feels true and relevant and real. The thoughts are coming thick and fast, like things that I’ve always known are pushing themselves into consciousness. Each one of these thoughts could be expounded in its own session. What I’ve just said sounds terribly, terribly crazy. I pinch a look upwards at her face, but she’s just looking steadily back at me, furrows in her brow. She nods slowly, looking intentfully at me, like she’s trying to absorb it all and make sure she doesn’t miss a single beat of what I’m saying. I’m expecting her to laugh at me incredulously, like I’m insane and that I’m talking rubbish. But it glows warm on the inside that she’s taking me seriously. Maybe it’s okay to say this stuff, and acknowledge it. ‘So you’re actually trying to keep yourself safe, by making sure you don’t feel safe?’ she says. I look at her like she’s just said something extraordinary. I turn it over in my mind. Could this be it? – Therefore what I’m doing, not wanting to feel safe, is actually a smart thing to do, rather than insane? ‘Yes,’ I say once I’ve fully grasped it. ‘Yes, I think that’s it.’ And I breathe out the tension I’ve been holding. I’m not mad. At least, not entirely. ‘Does it matter, though?’ I say, with sudden passion, as I switch sides within myself and take up the contrarian position. ‘Does it matter if I don’t keep myself safe? If I self-harm? If I go missing? If I …’ I wave my hands around to fill in the blanks that I don’t want to articulate. I’d forgotten, as always, that I matter to anyone. I’d forgotten that my actions have an impact on others. I feel irrevocably broken – entirely incapable of mentalising and empathising – that it doesn’t even occur to me. My significance to others is constantly dissociated from conscious thought. I sit sadly, not knowing what to say. This is a new thought to me. I’m not sure I understand it. ‘How do you mean?’ Asking this, too, will give me time. I squiggle my face around to try to understand. She pauses. I pause. Her words are like little thunderclaps of revelation on my mind. But I’m not sure I like them. I sit and let it sink in a little, and throw the thoughts from side to side in my brain, to see if I can rattle them into making sense. ‘But what if I don’t know how to manage my distress?’ I say. I shift uncomfortably on my seat. She’s right. I shrug and want to laugh her question away, but I realise that the clock is ticking and I need to make the most of these last few minutes. This is the million-dollar question. How do you ‘talk’ to ‘parts of yourself’? It all feels so nebulous and vague, faintly ridiculous, maybe even a touch insane. When I’m ‘me’, I’m not ‘them’. When I’m ‘here’, they’re not. So how do I talk to someone who isn’t ‘here’? And it makes me deeply uncomfortable. I have survived all my life by dissociating from these other parts of me. It feels counterintuitive, dangerous even, to communicate with them. If I talk to them, they might talk back. And then what will they say? I realise, with a gulping unease, that I know full well what they will say. Because I hear it. I just pretend that I don’t. From some parts – the younger, terrified, traumatised parts – I hear their constant wail, their agony, their distress, their neediness, their fear. It is mostly inarticulate, but it is unmistakeable. And unbearable. It is the scream of a traumatised child, unremitting, unheard, unsoothed. Like living next door to a neglected baby whose screams of abandonment fill the night, the only response is to block it out with headphones. From other parts – the critical ones – all day and all night I hear their rabid, frothing disgust towards me: utter disdain for who I am. Their angry, desultory shaming of me, pointing out my magnificent crapness as a human being, highlighting every error I make, pulling me apart, undermining me, running me down. I don’t want to tune into it. And then there’s the fearful parts. I hear their anxieties like the constant screech of fingernails down a blackboard: everything is a source of concern. Everything is going to go wrong. Everyone is going to hurt us. We’re going to mess everything up. And we will be hated by all. I look up and realise that some of this – I’m not sure entirely how much – has been vocalised out loud. Damn. ‘No wonder you don’t want to talk to them,’ the therapist says, sadly. I’m off the hook. She understands. ‘It sounds like all of you needs to think about how you to talk yourselves,’ she adds. I hang my head, ashamed, but also relieved. She has called me out on my self-abuse. She has called me out on the internal attitudes which are holding me in trauma. They are not the entirety of the problem, but they are at least the portion of the problem over which I have some control. I have to stop hating my parts. I have to stop being so discompassionate towards them, and blocking them out, and refusing to care. I have to accept that they are me, and I am them, and only together will we heal. That is the way forwards. It’s strange how I can feel both chastened and supported by her at the same time. She gets it. She gets me. But she also won’t let me make excuses. She demands change. She demands that I treat myself as she treats me. She refuses to be the only one who is responsible for compassion here. It sounds silly. It sounds mundane. ‘It sounds great,’ she says. I realise, with alarm, that I’ve never planned even for these trivialities. I’ve left therapy every single week with no plan at all, feeling powerless at what might happen next. And then hours later I have been surprised to find myself somewhere else having done who-knows-what. Walking out of the therapist’s door is the hardest part of the week. I move from the safety of containment and support back into the lawlessness of conflict within myself with no referee. I move from connection to aloneness. I move – too often – from hope to despair. These are the feelings which emanate from deep within me, from deep within the traumatised parts of myself, who feel this departure as abandonment and rejection. In my adult self I know that it is seven days, and I can cope, and I will be busy, and there is life to do. But these younger parts cannot envisage a future; they cannot imagine their return. To them it is the end, and they are stepping into the void. Shame overwhelms me every single time, at this hidden neediness within. And – I realise without saying – often I drive myself into unsafeness as revenge for the abandonment. But this final conversation in itself has been grounding. I realise that it doesn’t matter so much what I plan to do, as much as that I do plan. And that I commit within myself to taking care of myself. To staying safe. And that I resist the temptation to counteract the healing effects of therapy by returning to the status quo of agitation and unsafeness. ‘Be kind to yourself,’ she says as I leave. Easier said than done, I want to reply, but I don’t, because I know I’m making excuses and leaving the door open to myself to resort to abusiveness. ‘I will,’ I say, and once the words are out I accept it as a promise, and a determination, and a plan. My stomach crunches up inside me at the prospect of it – being kind! what a thought! – and there’s an immediate rush of panic, that it’s not safe. But I’ve said it. And so I’ll do it. At the very least, I’ll try. I really enjoy reading your blogs Carolyn, they are so pure, honest and thought provoking. I especially love the case study excerpts- I learn a lot from them. Thankyou for this article – it has come at a perfect time for me. I am currently working with a therapist for trauma and this week has gone off the rails but this article has really helped me to understand things a bit more. I really enjoyed reading this and as i read this i felt myself back in my therapy room experiencing the same. But reading your journey of it gives me hope i soon will also learn to make safety plans and implement them. Wow, these are so powerful. Thank you. I identified with much of what you have written both personally and professionally. 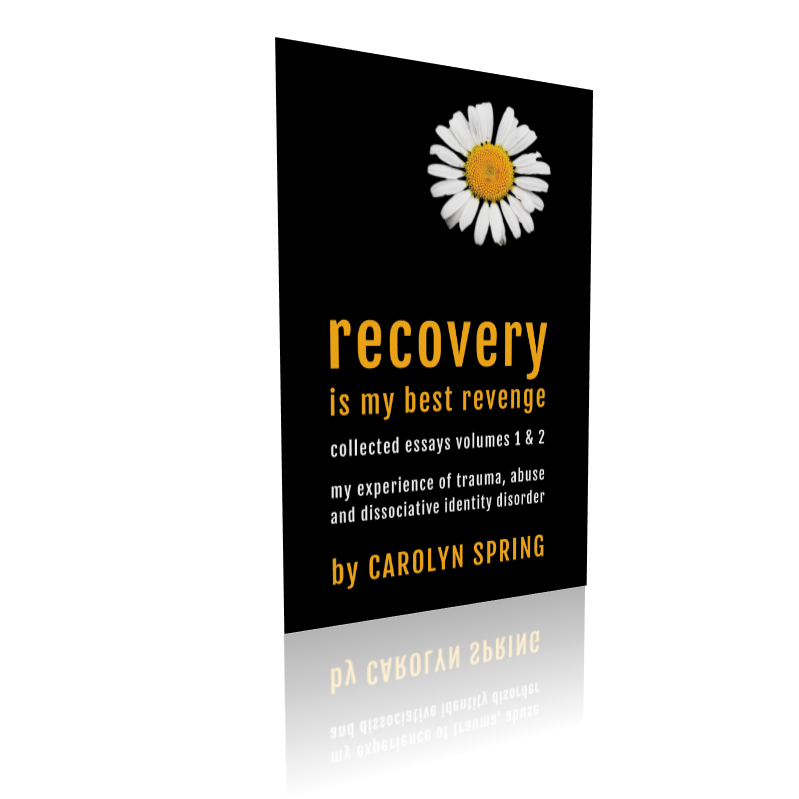 Thank you for writing and sharing this information and most importantly, for sharing personal your personal recovery process with people. This is very encouraging. I spent many years in therapy and was supported to the point of being able to support my self, and be self harm free, which took a me many years to do. So with the right support, it is achievable. I enjoy reading your blog ,as it is very inspiring. Much appreciation for the time and energy, that you and your team put in to it. It is making a positive difference to the professionals and volunteers who support survivors like my self. Regardless of where we are in the our personal life long recovery process. This blog is helping have a positive impact on people’s over all health and well being. You put into words exactly what I think and feel. Thank you. Thank you so much. Every blog post is a gift to us all. The first blog of yours I have read – and so much hit home. Especially about trying to understand that I matter. Thank you. I needed to read this today after therapy, thank you. Wow! Its like looking in the mirror, it was so powerful. I felt like it was me having a session with my therapist. So many quotes reflected back on me. Carolyn thank you for sharing so much. I’ve learned masses from everything you write and all the pods courses. So grateful and empowered. It depends what you mean exactly. For an official ‘diagnosis’ of DID, you’d need to be assessed ideally using the SCID-D. See for example https://information.pods-online.org.uk/how-is-dissociative-identity-disorder-diagnosed/. But in simple (even simplistic) and metaphorical terms, are you ‘open plan’ or ‘different rooms of a house/building’? In my home I have an open plan living area where I can move between cooking in the kitchen area (one ‘mood’) to watching TV in the lounge area (another) to working in the lounge area (yet another). I’m feeling differently, acting differently, when moving between areas, but I still retain a sense of cohesion, that I’m the same person, and I don’t forget who I am from when I’m in the kitchen area to when I’m in the study area. DID is more like living in a block of flats in the same building, where there are walls and doors, and you can’t necessarily ‘see’ what’s going on in one room from another – or even at times remember. But neither is it at clear-cut as that … everyone is somewhere on a spectrum. I went over the course of therapy from living in separate flats to knocking down some walls to eventually living ‘open plan’. But at any one point it would have been hard to identify exactly where I was at on my ‘building project’. So very helpful. Your book is amazing. I am glad you are healing from your severe childhood trauma. You are the bravest and strongest person for what you have been through and have turned it around to help others. I salute you wonder woman!!! It was such a relief to read this. I’ve always ‘known’that it’s not safe to feel safe, but I’ve never heard it expressed by anyone else. If I allow myself to feel safe I quicky begin to panic about what will go wrong – what I will do wrong to spoil it. This makes me constantly on edge and leads to me taking unhelpful rather than helpful actions. Thank you so much for writing this..